SKU: 0 609408 422287. Category: Action, All, Historical, Released, War. Tags: Historical, War, World War I, WWI. 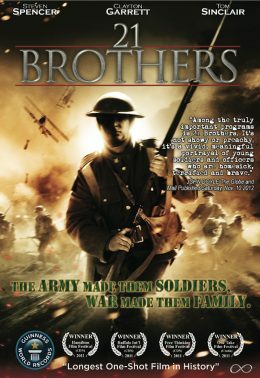 21 Brothers tells the story of the Canadians 21st Battalion as they prepare for the battle of Courcelette in World War I. Taking place in real time, the film follows Sgt. Reid as he must get his men ready for the impending battle. Not only must he prep his battalion Sgt. Reid must also deal with the day to day difficulties of life in the trenches, including injuries to his men, supply issues, and an underage recruit who has recently been sent into the front lines. This is a unique portrayal of the seldom-seen World War I trenches. The films chronicling the second world war are numerous, but who has seen a film on World War I? 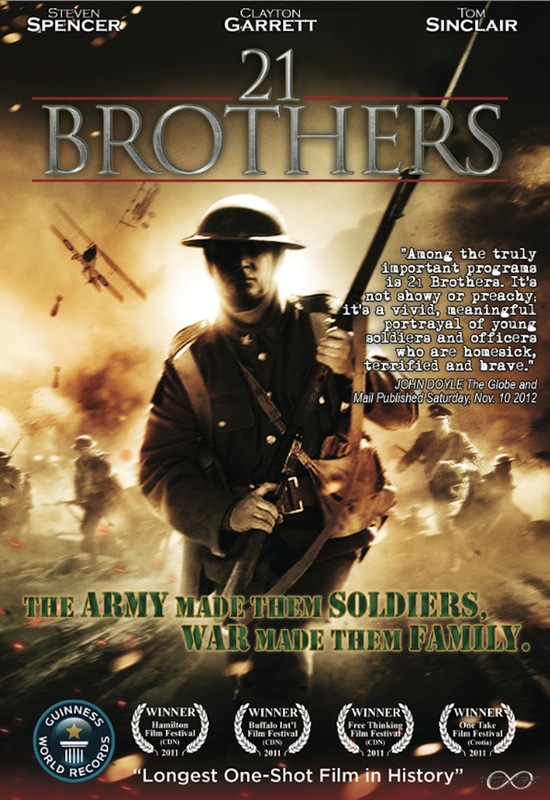 21 Brother is a war movie about the soldier and the relationships they made during World War 1, similar to Saving Private Ryan. It has been received acclaim at both Buffalo Film Festival and the Free Thinking Film Festival, and is slated to be shown at Horizon Film Festival in the UK on June 22nd 2013. 90% of all responses on “Rotten Tomatoes.com” movie review website want to see this movie when released. It has won the Guinness world record for the longest one shot film.